Blockhouses were built on the Yelm Prairie and elsewhere. Northwestern historians and old settlers in Washington have disagreed heartily upon several points in connection with the singing of the Medicine Creek treaty, entered into by Gov. Isaac J. Stevens with the Indians of the region in 1854. At the pioneers’ picnic at Lake Sequalitachew Wednesday, Edwin Eells, a native son of Washington, read a paper on this subject. It is a theme on which he had bestowed considerable thought and to which he had devoted long research. It is said by northwest historians to have cleared up several disputed points about the incident. Mr. Eels concludes in favor of Gov. Stevens and suggests that a monument to mark the spot would be eminently fitting. It is a privilege we all heartily enjoy of meeting here today, on this historic spot made memorable by the unfurling of the stars and stripes 69 years ago, by the representatives of the United States government under the supervision of Commodore Wilkes. Personally, I take a peculiar pleasure in this observance, as it is both the month and the year of my own birth in this state. The good services of the State Historical society in marking this spot with that appropriate monument is well worthy of its object. The pioneers of the state are closely allied to the historical society from whom it draws much of its most interesting information, and they are also indebted to it for preserving the memories of the past, and doing honor to the brave and the true who were prominent factors in the deeds of the long ago. It is peculiarly appropriate that we today suggest the propriety of marking another spot not many miles from here, and just across the line over in Thurston county, whose pioneer society is here represented, where 55 years ago another holiday—Christmas—was observed with most interesting ceremonies. I refer to what is commonly known as Medicine Creek treaty with the Indians of the upper sound region, and which was the first treaty made in this then territory, for the extinguishing of the Indian titles to the extinguishing of the Indian titles to the lands then partially occupied by white people. Gov. Isaac J. Stevens was the first governor of Washington Territory, and was appointed in March, 1853. He was a man, small in stature, but big in brain, and of indomitable, usually doing the work of three men. This office at that time carried with it ex officio, the position of superintendent of Indian affairs. He was also charged with the duty of exploring the country and ascertaining the practicability of a railroad route across the northern belt, of the United States and connecting with the waters of Puget Sound. This he did with marked efficiency and success. Starting from the head waters of the Mississippi river with a party which at first consisted of nearly 250 men, he spent six months on the way making the necessary investigations, arriving in Olympia November 25, 1853. On his way he came through the counties of many warlike Indians, known to be hostile, not only to the whites, but also almost constantly at war among them were the Blackfeet, the terror of those times. With singular tact and marked success he not only gained their consent for him to pass through their country, but secured their friendship, so that he was specially appointed to make a treaty with them, which he did two years later. This secured peace and amity, was lasting, and of untold benefit in the development of the northwest coast. In doing all of this he gained an experience which was of material benefit to him in dealing with the Indians of this territory in later years. Almost immediately on his arrival he issued a proclamation, calling for an election to be held on the 30th of the following January to choose a delegate to congress and members of the first legislature, which met February 28, 1854. During this time he made a hired excursion down the Sound in a sailboat called a “plunger,” along the eastern shore, going as far as Victoria, where he met the representatives of the Hudson’s Bay company. While en route he visited and conferred with many tribes of Indians, and got glimpses of their number, condition, modes of life, etc. With this information as a basis he subsequently developed an Indian policy, which he endeavored to carry out. Urgent business called him back to Washington City and he left Olympia on the 26th of March for the seat of government, going by way of San Francisco and the Isthmus. He arrived in New York in May and immediately went to Washington city, where he spent several months. The following September, accompanied by his wife and four children, he left Boston for Puget Sound, arriving about the 1st of December, having been detained on his way about six weeks by serious sickness in his family from the Panama fever. The second legislature met on the 4th of December and on the following day he delivered his message to that body. While the legislature was in session he planned his campaign and organized his force, for extinguishing the possessory titles of the Indians to the lands in this territory. Most of the treaties were prepared in Olympia before he started out, with the intention of trying to induce the Indians to accept the terms. I have been thus full in describing Gov. Stevens work and circumstances, in order to show hoe little time he had for the peroration and consideration of the important matters connected with the Indians. He was a very able man, saw all the points of a case at a glance, made up his mind quickly, and then went at things with a rush and almost always made it go. If in the hurry and bustle or the times he should have made a few mistakes, it would not only have been excusable, but ought to have been expected. 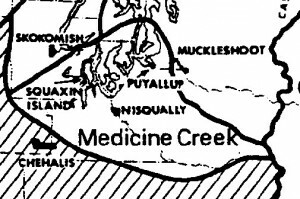 On the other side of the Nisqually river and running parallel with it, and about a half mile distant is a small stream now known as McAllister’s creek, then called She-nh-nan or Medicine Creek, which also empties into the waters of the Sound. Its source is a very large spring, near the foot of the bluff from which it gushes forth, at almost its full size from the start. About a mile above its mouth on a high knoll above the surrounding marsh and between the two streams was the spot selected for the meeting. A party of men having been sent down a few days before to clear the ground and erect the tents, on the 24th of December Gov. Stevens and his staff came down from Olympia in canoes and made their camp. Word having been sent out, between 600 and 700 Indians had come together and on the following day they assembled to meet the governor. Through interpreters he explained to them what he wanted, gave them presents of food, etc. for a sumptuous Christmas dinner and dismissed them until the next day. In the meantime members of his party were busily engaged in doing missionary work, explaining, persuading and trying to induce them to assent to the terms he desired them to accede to. On the 26th they reassembled, and the negotiations were concluded by the signing of the treaty by Gov. Stevens representing the government on the one part and 62 chiefs and head men making their marks, which were witnessed by 19 white persons, on the other part. The tribes represented were the Nisqually, Puyallup and Squakson Indians. By the terms of the treaty the Indians relinquished their exclusive right of occupancy to all of Thurston and Pierce as well as parts of King and Mason counties. The government agreed to pay $65,000 in annual installments during the term of 20 years, one-half to be paid in goods, such as blankets, clothing, tools, etc., in the way of annuities, and the other half to be used in moving them to their reservations and getting them settled thereon. They were also to be provided with schools and carpenters, blacksmiths, and farmers to instruct them in the arts of civilized life, and also a physician. Three reservations of about 1,280 acres each were assigned them. 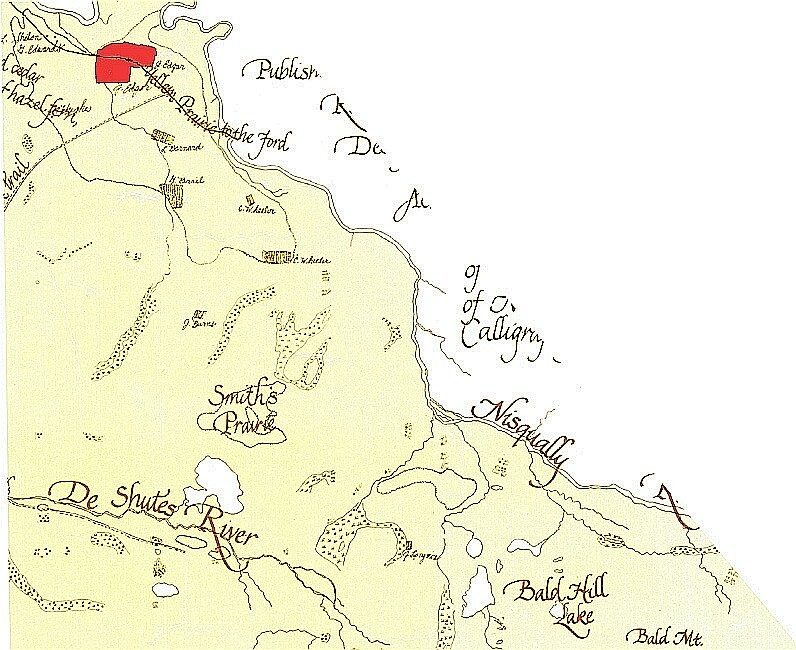 One comprising the Squakson island, 12 miles north of Olympia, on which it was expected to locate the superintendency and headquarters of the Indians. Here a very considerable amount of money was subsequently expended, and for the Nisqually Indians two sections of land near the mouth of the Nisqually river, and the same amount on the south side of Commencement bay for the use of the Puyallup Indians. It was also provided that if at any time the government should see fit, it would have the right to remove them to some other reservation by paying them for their improvements and the expense of moving them and also assigning them other lands of equal or greater value. The treaty having been duly signed and witnessed was immediately dispatched to Washington city, and on the 3rd of March, 1855, was ratified by the senate and became a law, being the first and only treaty which was acted upon during the next four years. Although treaties were made with all the other Indians on the Sound during the six weeks immediately following, they did not reach Washington city in time to be acted upon at that session. Before congress again assembled the following winter, the Indian war had broken out which, with other contributory cause, delayed action on the other treaties until 1859. 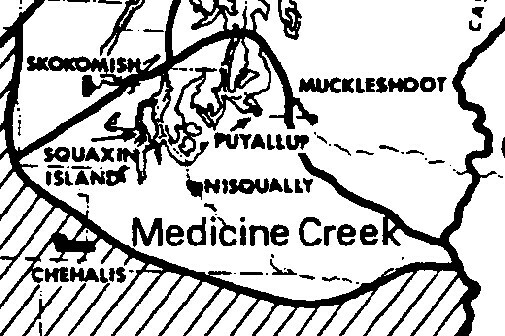 After the close of the Indian war it appeared that there was much dissatisfaction among the Indians with the Nisqually and Puyallup reservations both as to size, location and quality. At a subsequent meeting with the Indians new reservations, the ones they at present occupy, were assigned them to which they agreed. These selections were approved by the president and became their subsequent homes. The officers of the government have been severely criticized for the way in which this treaty was made. It has been claimed that the Indians were overreached, given very inadequate reservations, and otherwise imposed upon, that it was one of the contributory causes of the Indian war that followed. It is even claimed tat some Indians whose names were appended to the treaty as signers never made their marks at all, but were violently opposed to its terms, and that one of them went so far as to tear up his commission as sub-chief. It is true that the land assigned them was very unsuited to their needs. It is also true that at least three of the signers of the treaty joined the hostiles and were very active enemies of the whites in the war that followed.